Two Championship play-off places, two relegation play-off places and one automatic relegation place were ‘up for grabs’ at the weekend. Nine teams were involved meaning six games kicked off simultaneously. The permutations seemed endless. The hope, the fear, the excitement and the despair. The 90 minutes of football had it all as 23 goals were exchanged in the six games. 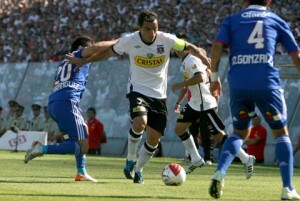 Could Santiago Morning stave off relegation and do the unthinkable and reach the Clausura play-offs? Could Unión Española blow their place in the Clausura play-offs? 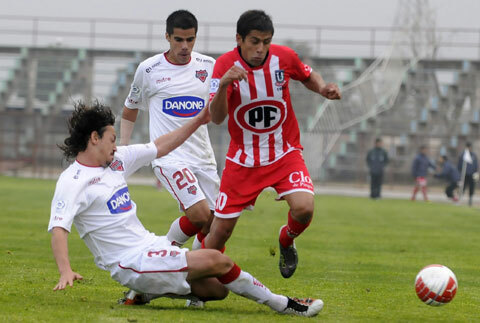 Could Unión San Felipe win for the frost time in eight matches to rise out of danger? And then there was one. One week to save their season. One week to define their season. One week to prolong their season, for better or worse. Not for Ñublense however. Their time was up when Octavo Pozo scored a late third goal for Unión La Calera to secure a 3-1 win, consigning Ñublense to Primera B next year. But Unión Española, Cobresal, Unión La Calera, Santiago Wanderers, Santiago Morning, Deportes Iquique, Universidad de Concepción, Unión San Felipe and Huachipato all face a Sunday showdown to reach the Clausura Championship play-offs, avoid the dreaded relegation play-offs or stave off relegation. Or in some cases all three! Unión Espanola will confirm their Clausura play-off place with a win at Universidad de Concepción who will then have to rely on results elsewhere to survive in the Primera Division. Cobresal will avoid relegation and confirm a Championship play-off place by picking up three points at home to Santiago Morning who would then be relegated. A Santiago Morning win – they have to win to have any chance of surviving – would see them leapfrog Cobresal in both the General and Clausura table, into a possible Championship play-off place. But again they would have to rely on results elsewhere. For example . . . actually there are far too many permutations to even consider. It would take Sheldon Cooper, a blackboard and his lunatic genius to work out. Week 15 Round-up – Among the goals the league becomes clearer . . . and less clear. The English Premier League has been in the news of late for the frequency in which goals have been scored; defences conspicuous by their absence as Robin Van Persie, David Silva, Edin Dzeko et al take advantage. Similarly, in Chile goals are flowing on a regular occurrence; forwards coming out on top as teams see attack as the best strategy to propel them into the play-offs or escape the dreaded relegation zone and play-offs. And week 15 was no different. The only constant factor in both the Clausura and General tables is table topping Universidad de Chile, winners once again, as the rest continue to trade places, making it muy difícil (very difficult) for anyone to predict the final league placings. Analysing week 15 we can establish that Universidad Católica will join rivals Universidad de Chile in next years Copa Liberatadores while Cobreloa, Audax Italiano and Colo-Colo – despite defeat – will take part in the end of season play-offs. They are likely to be joined by Deportes La Serena and Católica – should be confirmed after the next round of matches – but six points separates Santiago Morning, who currently occupy the final play-off spot, and Palestino in 17th. Santiago Moring are still in relegation trouble also; the race to avoid the drop or the relegation play-offs equally tight, six points between the bottom eight in the General table. As the Chilean Clausura draws to a close it seems teams are attempting to make the league as exciting as possible, outdoing what they had done the previous week with goals, red cards, talking points and more goals. And the most exciting of them all was the Superclásico, contested between Chile’s two most illustrious names, Colo Colo and Universidad de Chile, who served up a contest with all the above – including four of the 31 goals scored over the weekend. And before there is any mention of the other 16 teams it is only right that we jump straight into the Superclásico, which more than lived up to its name, exploding into life with little more than four minutes on the clock . 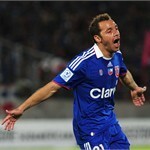 . .
Universidad de Chile confirmed their place in the quarter-finals of the Copa Sudamericana with a single goal victory at home to Flamengo through long range rocket from Marcelo Diaz; triumphing 5-0 on aggregate. The seriousness at which each team were taking the game was shown in the two line-ups. La U made only the one change from the emphatic first-leg win in Brazil, promising forward Felipe Gallegos replacing Francisco Castro. Vanderlei Luxemburgo meanwhile made wholesale changes, nine of the team that started the first leg were absent from the starting line-up. Ronaldinho was amongst those left behind in Brazil, Luxemburgo only bringing a squad of 15. The vociferous home crowd at Santiago’s National Stadium were rewarded after 20 minutes as Diaz ran onto a loose ball outside the box, unleashing a left-footed effort with optimum slice into the top corner. Tie over. 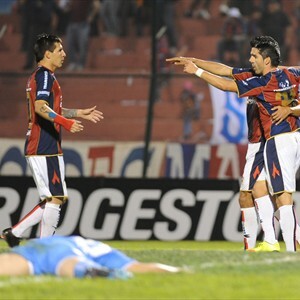 It was another goal-fuelled weekend in the Chilean Primera División as the league takes a resemblance of shape, entering the home straight before the end of season play-offs. 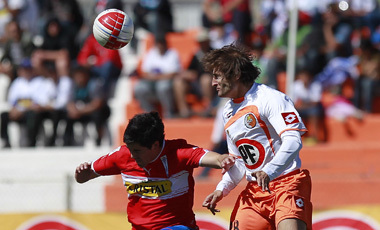 With Universidad de Chile all but secured of first position it was the three teams directly below them, Colo Colo, Audax Italiano and Cobreloa, who had a fine weekend, all but sealing their spots in the Clausura play-offs – mathematics dictate that either of the teams could fall out of the places with a disastrous finish. In the lower echelons of the play-offs Unión La Calera and Unión Española traded positions with Cobresal and Ñublense while Universidad Católica hung on to their place with a spirited and unexpected comeback against Cobresal. There was little change at the bottom of the general table which decides relegation, the bottom six all failing to win.